Richpanel Data Co-op is a program that lets members work together to better understand consumers across devices while ensuring highest levels of security and transparency. The proprietary technology uses Artificial Intelligence to understand how devices are related to people. Fig: How are the devices linked to people? This allows businesses to deliver hyper-personalized experiences to consumers as they move across different devices. The new consumer is hyper connected. Today, a consumer uses multiple devices across multiple channels. Businesses are left with isolated data sets and are paralyzed when it comes to connecting these data silos. The Richpanel Customer Data Platform helps businesses to overcome this challenge by connecting complex data silos and connecting customer identities with millisecond latencies. Systems today can reveal insights for a specific device. But devices don't buy stuff, people do. The Data Co-op program is engineered to further improve the accuracy of your visitor data by understanding how devices are connected to people. Richpanel Data Co-op helps businesses to establish and share links between consumers and devices so they can answer people centric questions. Say a consumer identifies himself (logs in) on a travel website using a mobile, Richpanel creates a link between the consumer and this mobile. 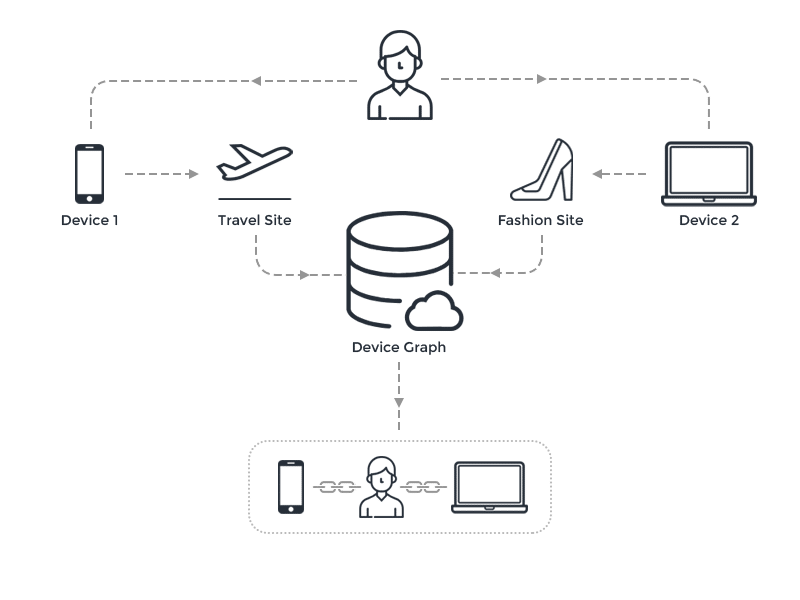 Similarly, when the consumer identifies himself on a fashion website using his laptop, Richpanel will create a second link between the consumer and his laptop. Both members could be seeing traffic from these devices, but they now understand how they are linked. These links are cryptographically hashed and stored in a central Shared Device Graph database. The hashing fully hides the consumer’s identity. The program does not share consumer’s identity or attributes like name, email, phone, etc. By understanding relationship between a consumer, devices and channels, members can better understand the role of each channel and how consumers are moving across these channels. Members can now personalize content based on information they have on the consumer not just the device. They can also record content engagement across all devices and store it in the consumer profile. You can use the device graph to limit ad impressions to a person. Traditionally ad impressions work on a per device basis. Stay in front of your audience across mobile, web and other browsers they use on a daily basis. Dramatically improve conversions by reaching the consumer across screens they use. All identifiers are hashed so members don’t have access to the consumer’s Personally Identifiable Information (PII). Members benefit to the extent they contribute. A member can only access the device link for a consumer if they have seen the consumer or device before. Member does not get access to all devices or consumers in the network. The device graph helps members better understand how devices in their own network are related. Take your 14 day free trial now or Contact sales for 1:1 demo.